U.S. loans bolster solar investment in South Africa and encourage U.S. companies to lead the worldwide solar industry. SunEdison (NASDAQOTH:SUNEQ) was just awarded a 60MW $250 million project by the South African government. And not only this, the project is funded in part by $185 million in debt issued by the Offshore Private Investment Corporation, OPIC. SunEdison will own 51% of the project with the rest owned mostly by South African investors. Taking on the OPIC debt means that SunEdison's shareholders will have to earn out almost 1.5 times their $125 million stake in the project. Fingers crossed, the project should be completed by the fourth quarter of 2014 and supply power for 20 years to Eskom, the South African government-owned electrical utility. According to OPIC's project site this appears to be OPIC's first solar project in Africa (other solar projects were recently funded in Afghanistan and India). No longer "nice to have"
Recent solar panel supply gluts have been waiting impatiently for demand growth. Solar demand is flaring up with India to install 10 gigawatts by 2017, China a 35 gigawatt target by 2020, and South Africa up to 3 gigawatts by 2020. The U.S. and the E.U.have demand generation proposals to relieve tariffs and encourage investment. To give this a little context, peak power capacity in a sweltering New York City summer can top 9 gigawatts. To ease the burden, solar panels are popping all over the city through 150 MW of projects with more to come. Everyone is getting in on the act. Electricity and green trading desks at banks and trading companies are beginning to pull together solar swaps, swaptions, and other plays on the "sun-spark" spread. Companies like SunEdison have been enabling these plays with solar-specific purchase power agreements. These agreements can be reengineered into tradable over-the-counter instruments that can be used to facilitate collateralization of solar projects. The solar industry is plagued with many issues, not the least of which is its lackluster ability to pay off its debts. A slowly emerging tax rebate, investor awareness, and long project sales cycle all contribute to a low cash conversion cycle. 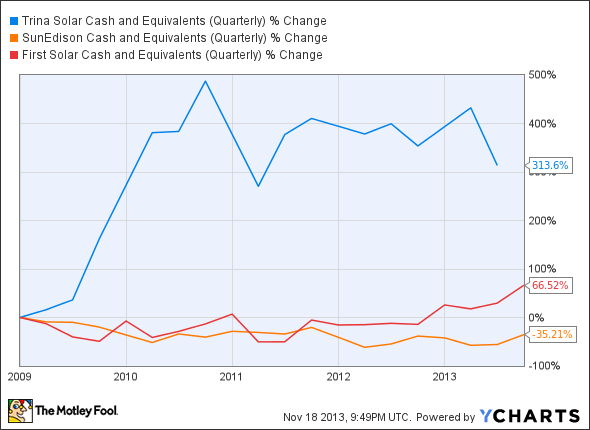 The chart below illustrates the movement of cash and cash equivalents. For project oriented companies like those in the solar industry, a lot of this movement is due to moving work in progress project inventory into client accepted and finished work. This means a walk-through of the complete project (it delivers electricity reliably) by a committee of federal, state/provincial, local, banks, and special interest groups -- no fun if you have ever had the pleasure. SunEdison's downward cash position will be bolstered by its ongoing project completions in North America, India, and the Philippines. Trina Solar (NYSE:TSL) and First Solar (NASDAQ:FSLR) have maturing project portfolios that throw off steadier streams of cash than SunEdison. For now investors will have to wait before the debt and payables (at 46% and 26% of revenue) stop dragging inventory and receivables down (at 6% and 11% of revenues). Even a quick glance at stock price movement tells us the sector is breaking out. 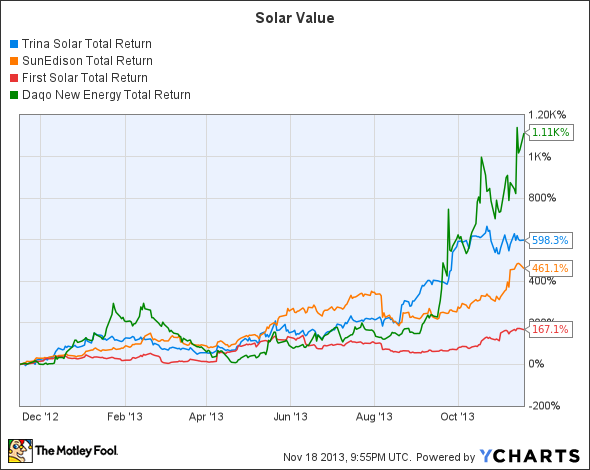 The following chart depicts the dramatic step up solar stocks have taken. It is a quantum leap, and all due to the persistence of investors who have been saying for years that government concessions will not only foot the tax bill but provide a solid balance sheet for project finance. SunEdison is already well involved in India with over megawatts of projects in play. Its foray into South Africa will help geographically diversify its North American and Asia portfolios. A few of SunEdison's India projects have been partly financed by the Renewable Energy Asia Fund, or REAF, run by Berkeley Energy LLP out of the U.K. It turns out that Berkeley Energy will also run the newly established African Renewable Energy Fund, the AREF, sponsored by the African Development Bank. Companies like First Solar and Trina Solar all have teams that are working with REAF and the newly established AREF. These financing vehicles will not only allow even greater solar project diversification, but will bolster balance sheets.